It’s always fun to take a vacation! Whether it’s a summer beach get-away, or a winter ski trip, it should be a great time for all. Unfortunately for some, the flight that often gets you to that vacation can aggravate dry eye symptoms, making the trip much less comfortable for those that suffer from this condition! The temperature- and pressure-controlled cabin of an airplane creates a very dry environment that can easily take its toll on your eyes. One of the first things to consider when flying is whether you want to wear your contact lenses or eyeglasses while in transit. Contact lenses tend to increase the chances of dry eyes, even under normal conditions, and this is even more true in especially dry air of the airplane cabin. If you wear contact lenses, you may consider switching to a pair of glasses during the flight to cut out this increased risk. Dehydration can also be a real problem, potentially making dry eye symptoms much worse. Be sure to have a drink on hand at all times, making sure to drink before, during and after your flight. Alcoholic beverages and caffeinated drinks such as tea or coffee may increase the chances of dehydration and those who enjoy these types of beverages in-flight should be sure to drink extra fluids to compensate. 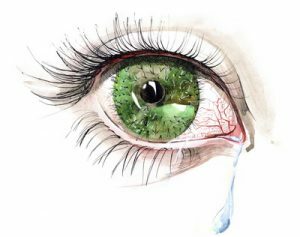 In case you take all of these preventative measures, and your eyes still feel dry and uncomfortable, you should also carry with you artificial tears. Having a bottle of artificial tears with you at all times during your trip will allow you to apply them as needed. This can help out a great deal. If you suffer from chronic dry eyes, you should speak with our eye doctors before your flight to discuss other ways that we may be able to help make your flight more comfortable. For more information of Dry Eyes, feel free to stop by for a visit with our eye care professionals at Rogers Regional Eye Center, today!